Trump supporters, you elected a man that is a pathological liar, ignores the Rule of Law, tries to delegitimize the Press, the Justice Department, and Intelligence Agencies, changes his mind about signing legislation at the drop of a hat, has admitted to committing sexual harassment, takes credit for the booming economy that Obama created, is at the center of our current political chaos, has polarized our nation, and destabilized the world. Even with all these obvious signs, why are some of you still supporting Trump? What’s wrong with you people. Do you have low moral character too, or are you racists or just too stupid to understand what you see and hear with your own eyes and ears? Most of Trump ‘s “very best people” that he hand picked, have either quit, been fired, been indicted for lying or worse, been convicted of a felony, or have been sentenced to prison. Trump ignored the vetting process and picked people of poor moral character with criminal tendencies on purpose. If most of those people are dirty, more than likely, Trump is dirty, and that’s bad for America. Trump isn’t even trying to hide any of his destabilizing behavior. Trump agreed with Putin over U.S. Intelligence agencies regarding Russian election meddling, was not enthusiastic about placing sanctions on Russia, just recently removed sanctions on Russia before Russia could be adequately dealt with, has bad mouthed U.S. Allies but not a negative word about Putin. Trump has met with Russian dignitaries and Putin several times without American’s present. One of those meetings was in the Oval Office where Trump discussed Top Secret Information. Even when an American translator was present, Trump won’t release the transcripts of what was discussed. Trump wants to break up NATO and the EU, is methodically removing American influence from the world stage, and is placing uncertainty in the U.S. economy by placing tariffs on other nations, and now has initiated a government shutdown. The government shutdown places millions of Americans under financial and physical stress. Some people may even die because they can’t afford healthcare or their medicine. These are all moves that Putin would approve of. Just watching Trump’s love affair with Putin, you really do begin to think that Trump could be a Russian asset. Too many dots in the above sections are connected to Trump. Since the items in sections 1 and 2 are absolute facts, why would you want a President that would be involved in any of it. It’s time to get serious. I know Trump was elected because of government gridlock, and Americans did not want to elect a politician. We have seen enough, and the experiment is over. Trump in not going to pivot and become more Presidential and Congress is not performing their Constitutional oversight duties. This is a recipe for disaster for our country and indeed the world. If you care about Democracy, Freedom, and the Rule of Law, make sure you vote for anybody but Trump in 2020. God Bless America. For the past 2 years, Republicans had total control of the House, Senate, and the Presidency. They did not need a single Democratic vote, but did not budget any money to build a wall. Trump was recorded saying he accepts the responsibility for shutting down the government and won’t blame the Democrats. Of course he changed his mind and now he blames the Democrats for the Government shutdown. Even though the Democratic House and Republican Senate passed similar Bills to fund the Government, Trump refused to sign the bills after listening to FOX pundits. The National Emergency can’t be Americans being murdered by immigrants, because immigrants are not murdering our school children (some as young as 6 years old) , killing 58 and wounding 500+ people in Las Vegas, or committing serial killings all over the country. That would be White American men mostly. When you add Women, Black, and Hispanic Americans who also kill, far more Americans are being murdered by American Citizens. That’s the National Emergency. Trump and the Republicans barely made a whisper about Americans killing each other, especially when it involved gun violence. Shame on the Republican politicians and voters who look the other way. Yes lots of drugs are flowing through our Southern Border, but the immigrants are not forcing Americans to take those drugs. Even if there was a wall, Americans that want to abuse drugs or other substances would find a way. Nothing will stop them. Remember Prohibition, glue sniffing, and more recently Cheese (Black Tar Heroin, Tylenol PM, and Xanax), Crunk (Soda, Cough Syrup, and Prescription pain killers), Bath Salts, Hand Sanitizer, and Wasping (Insecticide). The last 4 are homemade, no border necessary). Gangs are a big problem, but it’s mostly American Gangs. 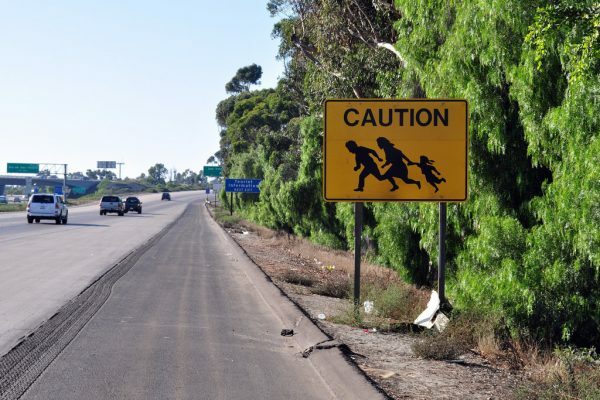 Gangs crossing the Southern Border represent only a small percent of the illegal aliens. This U.S. Customs & Border Patrol (CBP) link itemizes the different gangs they apprehend. The MS-13 gang represents just over 370 arrest in 2018. Trump said that number was in the thousands. Three hundred is hardly a National Emergency. Finally, what about terrorist crossing the Southern Border? Again the Republicans lied and said the number was in the thousands. For 2018, it was only 6. Again, no emergency. Republicans can’t govern even with majorities in the House, Senate, and the Presidency. So why should we trust them now that they lost the House of Representatives. They are very good at misdirection, half-truths, and lying. And of course, they have the liar in chief, President Trump. You don’t have to believe that Trump is colluding with Russia or obstructing the Russian investigation to know that he is dirty. There are too many people around Trump who resign or are fired because of misappropriating Federal funds, are indicted and plead guilty to felonies, and are sentenced to prison terms. Trump hand picked most of those people. There is no way he could surround himself with that many dirty people and he does not get dirty. Of course, Trump has to be dirty too. Even 5 year olds know if people around them are bad. I think Trump picked those dirty people so he could control them when he started doing his dirty deeds, and Trump is using the immigrants to deflect the spotlight off of himself. Donald, there is nowhere to hide now. Do yourself a favor and resign. What was I thinking? You can’t resign because, as an unindicted co conspirator in a felony, you will go to jail as Michael Cohen’s cellmate. I’d stay President as long as I could too. Good luck with that.